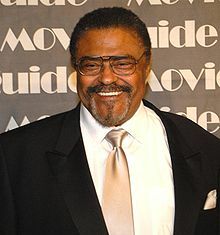 Roosevelt "Rosey" Grier (born July 14, 1932, in Brooklyn, New York) is an African American actor, Christian minister, and former professional football player. He was a noteworthy college football player for Pennsylvania State University who earned a retrospective place in the National Collegiate Athletic Association 100th anniversary list of 100 most influential student athletes. As a professional player, Grier was a member of the original Fearsome Foursome of the Los Angeles Rams and played in the Pro Bowl twice. (January 1, 1973). Needlepoint for Men. Walker Co, Back Cover. ISBN 0802704212. This page was last edited on 26 August 2018, at 00:07.